Competition, Hunter and 22/45 Models. • Specific disassembly and reassembley instructions for the differences between the Standard and 22/45 models. • 19 pages & 36 high-resolution grayscale images. 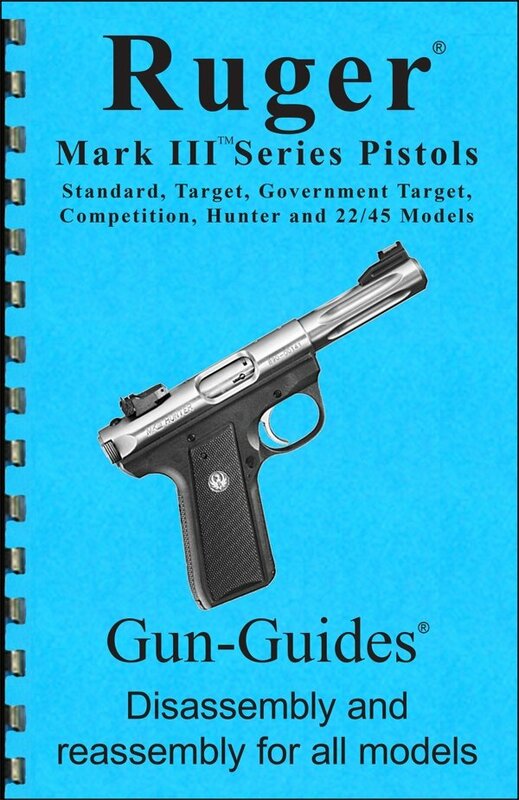 This Gun-Guide is a continuation of our very successful Ruger .22 Automatic Pistols - The Complete Guide for all models from 1947 ~2004. For the past 60 years, the Ruger .22 Pistol continues to be the largest selling, most popular .22 autoloading pistol in history. In 2004, Ruger introduced it’s next generation of .22 Pistols, The Ruger Mark III; available in Standard, Target, and 22/45 Models. As of 2008, they have sold over 250,000 Mark III Pistols. One the first features you will notice with the Mark III, is the new magazine release located just to the rear of the trigger guard. Ruger also incorporated a new front and rear sights (Hunter Models have micro-adjustable V-notch and HiViz fiber optic sights), an internal locking system, a new contoured ejection port, tapered bolt ears, loaded chamber indicator, a Weaver-style scope base adapter (on all adjustable sight models) and a magazine disconnect. In 2006, Ruger introduced the 22/45 Hunter which featured a fluted barrel and fiber optic sights. Interchangeable “LitePipes” were added in 2007 and were available in 6 colors for the Mark III and 22/45 Hunter Models. New for 2008 is the addition of a Hunter model with Crimson Trace Lasergrips.